Found: Sweet Memories | Are You Zhazha? Lola got the wonderful idea from her friend, Sandy, and she loved every minute of it. She especially loved hearing the laughs of the children and our reaction as we all hunted. They hid the clues so well around the house that I would walk right by them before starting the game and not even notice them. They were everywhere. Upstairs, downstairs, outside. The kids had us going up, down, left, right over and over again and they screamed and laughed and ran around the whole time. During one hunt, Andrew and I raced each other. 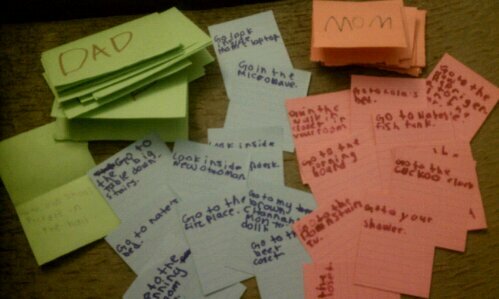 He searched for his dad clues and I looked for the ones labeled mom. I was still in my fancy polka-dotted dress from work. The dog followed us, barking at the frenzy. Andrew and Nate may have won (due to dog interference, I must add) but really we all won. The memories are a treasure – plus – each scavenger hunt ended with a special sweet direction to us like, “Let’s get ice cream” or “Let’s bake something sweet.” Smartest and sweetest scavenger hunts ever!